Natasha Capp is a young actress from LA who has two other talented siblings in the family, younger brother Steven and older sister Raffaela. All three were part of the cast for Bandit Hound. This past May, Rivenmaster’s Place introduced Raffaela Capp, the oldest of a very special group of talented siblings called “The Capp Kids.” While we endeavor to create articles centered around tweens and teens, we also occasionally like to update you regarding some of the amazing accomplishments of these prodigies even after they enter adulthood. Since returning to Los Angeles after completing the CAP21 Musical Theatre Professional Practicum and Showcase Program in New York City, Raffaela has been busy auditioning, training and writing! 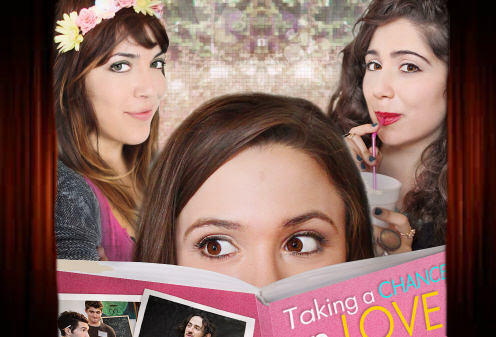 In need of additional material for her acting reel, she looked to her friends and family for collaboration and the result became the fun, comedic romantic short film, Taking a Chance on Love. Raffaela not only co–wrote the script, creating fun, memorable characters , but also plays the role of Brittany in the movie. Raffaela also collaborated with other like-minded emerging actors and her sister Natasha, who plays the role of Shoshana in the film and held a casting call, pulling their fellow actors from the Art of Acting School in Hollywood, the Ivana Chubbuck Studio in West Hollywood and James Franco’s Playhouse West/Studio4 in North Hollywood (where both sisters have studied). The result was an ensemble of seven talented, motivated and equally passionate emerging professionals who were ready to act. The combined cast and crew totaled 20 members on set over a three-day shoot and in three locations in Los Angeles including changing the interior of the lobby reception area of the Edgemar Theatre in Santa Monica to a coffee shop. Beautiful set design provided by the talented Jessica Miller. One of the most enjoyable parts of running this website is the opportunity to introduce talented sibling groups. Today we are honored to bring to you three truly talented siblings, each with their own unique set of talents. Their mother Maria shared with me that “The Capp Kids” have been surrounded by music and performance their entire lives.” Their mother is an acting coach and their father writes television and radio commercials for advertising. Their grandmother was a staple in the long island community and regional theatre for over 30 years. Additionally, their aunts and cousins also still currently act and perform in the theatre community back east. 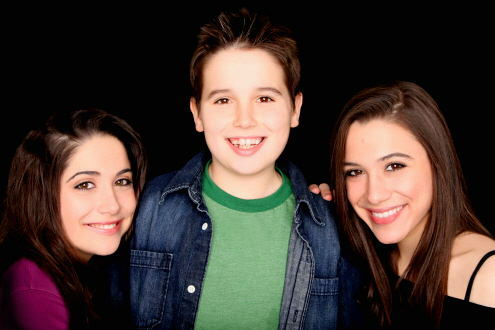 For the last 5 years all three of the Capp kids have taken their craft to a professional level auditioning and working in both New York and Los Angeles. The youngest of the siblings, Steven Thomas’ is now a 6th grade middle school student. Steven was literally born into acting and the world of performing arts. He was a mere 8 months old sitting, listening and watching while his two sisters, Raffaela and Natasha were on stage performing as Royal Princesses in The King & I and his mom Maria who owns an acting studio (Maria Capp Acting Studio), was choreographer of this huge musical production. Steven tagged along to all rehearsals and acting classes of not only the King & I but also to a number of other shows that his sisters and mom were involved with. 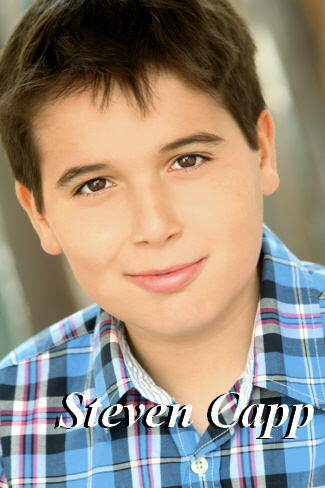 Steven was able to attend acting classes that his mom taught until his first theatrical debut in the musical “Footloose”, followed by his first television show, “Haunting Evidence” at the age of only 5. Early on Steven expressed interest in improvisation, comedy and theatre and went on to perform on stage and on camera in local commercials and theatrical productions while living on Long Island NY. When he lived in NYC, his efforts were focused mainly on film. Steven was fortunate to land lead and supporting roles in many NYU and Columbia Graduate films. He auditioned for one director of the MFA program of each school and was then referred to many of the other graduate classmates. This gave him the confidence and ease of working with adults, in front of the camera, and technical crews. Consistently Steven received praise and validation for his wit and mature demeanor while on set. Excited with the opportunities and adventure that lie ahead and nervous about everything being new, Steven’s feelings about the family move to Los Angeles was with trepidation as he was leaving behind the only home he knew on Sayville, LI and in Manhattan and all his friends and family!